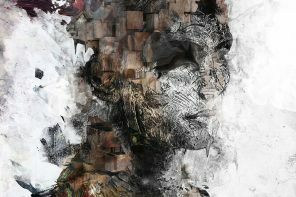 Most of us psychonauts are aware that the experience of our inner minds is really only the top layer. 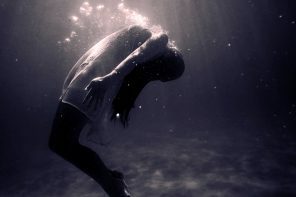 Below our conscious experience lies a deep and vast pool of subconsciousness, out of which our conscious awareness arises. 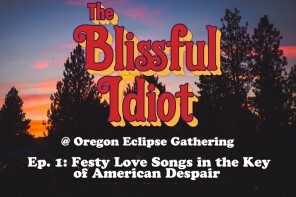 With his music, Simon Posford has somehow tapped into this phenomenon. 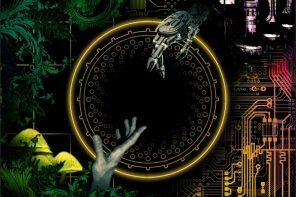 Like thoughts rising from the depths of our subconscious, as each layer within a track is introduced it feels as though we somehow intuitively knew it was coming. To be clear, by no means am I implying that his music is predictable; what I am trying to say is that Posford has developed the capability to plant seeds deep within our minds in such a way that as the music progresses, it feels as though we are manifesting it ourselves. 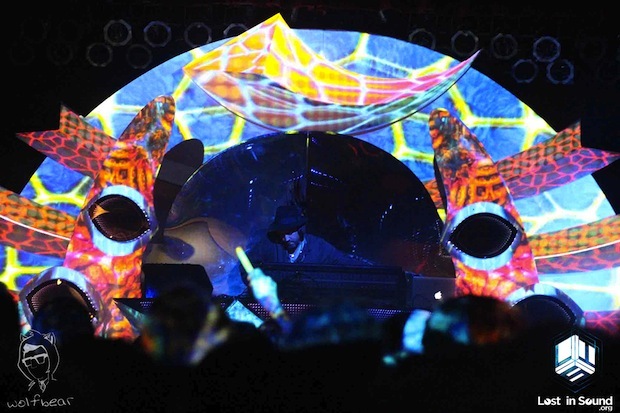 For this reason every trip to Shpongleland is by its very nature very deep and spiritual, and in a live setting becomes an experience that awakens our souls and encourages us to tap into the unity of our global consciousness. 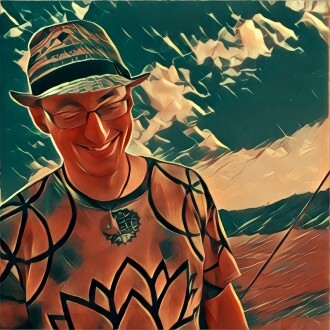 Considering the notion that the music of Shpongle is not just an auditory experience but rather more of a state of mind, obviously the visual presentation must be up to par. 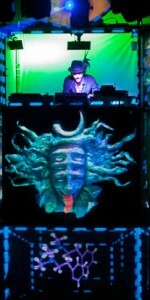 Over the years Shpongle has performed with a few different stages. 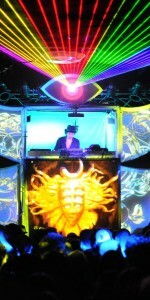 The first “Shpongletron Experience” arrived in 2011. 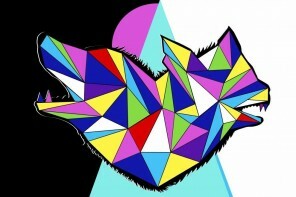 Designed by Boston local Peter Berdovsky a.k.a. 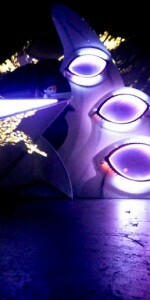 Zebbler, the stage consisted of a 15 foot tall massive construction that held Posford’s DJ booth at the top and had tiers below that dancers could perform on, all while being projected upon with some seriously psychedelic 3D mapping. At the center was a huge six foot tall version of the famous Shpongle mask that would wink and stick its tongue out at you throughout the performance. 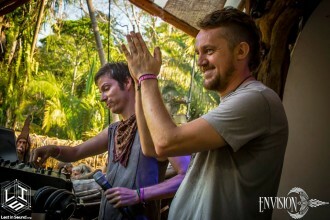 Next in 2012 Posford presented The Masquerade designed by Lucid Technology and Design, this time performing at the base of a Mayan temple. While the stage was simpler, the visual projections were intense and made the crowd feel like they were rocketing through space and time. 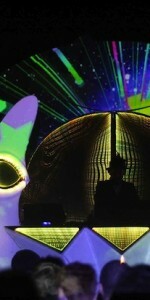 For his newest stage design, Posford brought Zebbler back on board to design the Shpongletron 3.0. 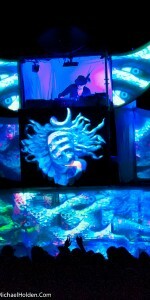 The Museum of Consciousness Tour was set to kick off with a bang in Boston on February 7th but was forced to cancel along with the first couple nights, due to complications from the U.S. visa office in the U.K. Posford was able to play a DJ set in Austin, TX but the official debut of the Shpongletron 3.0 took place at one of Asheville, North Carolina’s best venues, The Orange Peel. 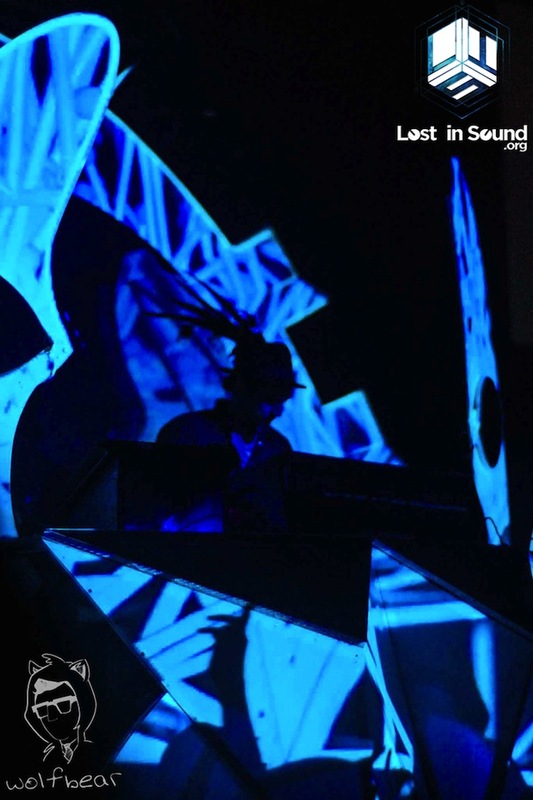 Lost in Sound was lucky to be there, as West Coast psybient duo Desert Dwellers made their first return to the North Carolina town since headlining the Visionary Art Fair with Alex and Allyson Grey back in December. Desert Dwellers’ energizing set was a sonic rallying cry – the downtempo spiritual nature of their style was a perfect fit to warm up the crowd and building anticipation for Shpongle to take the stage. 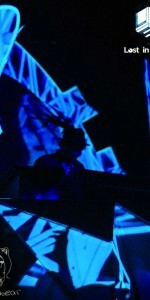 Shpongle’s set was an expectedly impressive amalgamation of raw, funky bass lines and soaring, intricately woven vocals. 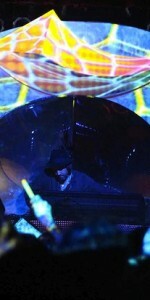 Posford performs with a elegant playful focus, smiling and dancing while the Shpongletron lit up in a flurry of psychedelic textures and treatments behind him. 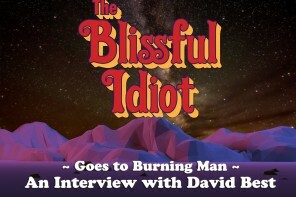 He appeared like a captain, steering his intergalactic spacecraft through a sonic cosmos. After playing through a wonderfully symphonic evening, Posford called out to the audience and apologized. “This is the first night of the tour, and we don’t really have an encore prepared yet.” He asked if we wouldn’t mind him hitting play on a pre-recorded track to join us in the audience, “I haven’t really had a chance to see this thing in action.” He disappeared into the audience while the Shpongletron visual team worked their magic. I think everyone in the audience wished they could see his proud face as he experienced the wonder of what had been blowing our minds for the past 90 minutes. 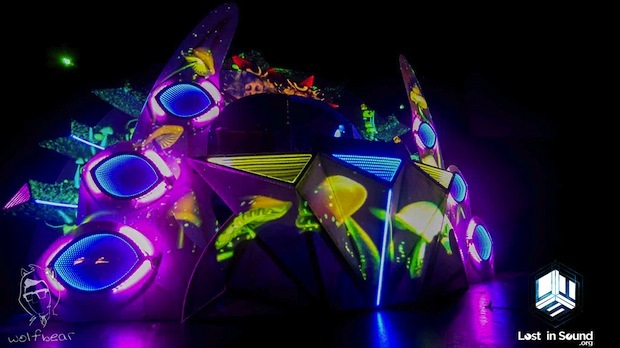 To gain some insight on the creative process involved with these wild and constantly evolving stage designs, Zebbler was kind enough to answer some questions for us. 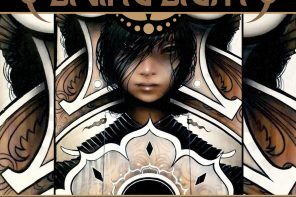 [LiS] What got you started in the visual arts, and how and when did your career start taking off? [Zebbler] I think my mom started my interest in the visual arts probably around three, when she gave me some pencils and I went nuts on the walls. My older brother also helped because he showed me that if you put your mind to it, you can get incredibly good at something in no time (he learned how to paint almost photorealistic tigers before giving it up for other pursuits by the age of 12). Also my older Belarusian high school art friend who confirmed my beliefs that the universe doesn’t come with a set of rules you must abide by, but rather you get to create those for yourself. 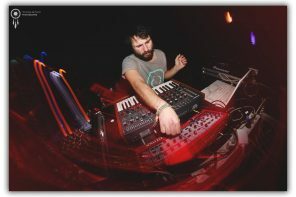 Then it was my post high school education (Massachusetts College of Art) where I finally learned how to channel my garbled brain frequencies into video projections on nightclub walls. I made it a point to use nearly all original content and got recommended to go on a US tour with the Ozric Tentacles right out of college in 2006. I jumped at the chance, barely knowing anything about the world of lighting or touring and just knowing that this is what I want to be doing, pushing this not yet fully existing VJ industry into its birth. I still try to channel that same intensity of a young learner – this is one of the fastest evolving industries out there. 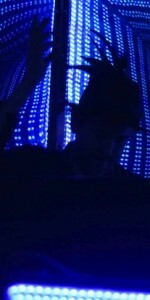 In my ten years as a VJ, I’ve gone from VHS to video mapping and LEDs. 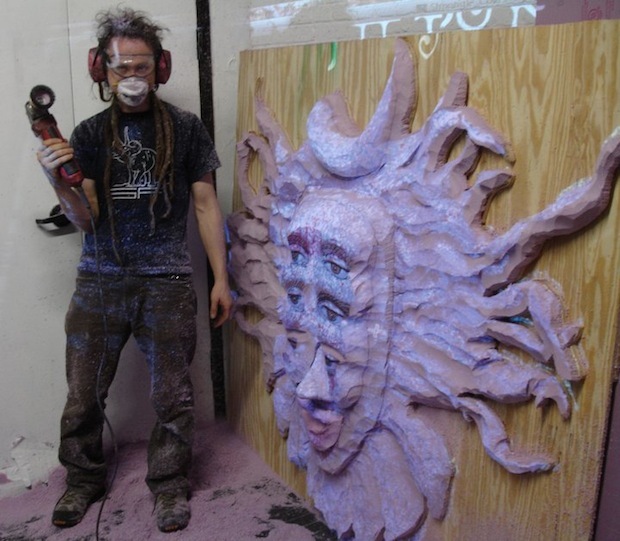 The mask you made on the first Shpongletron was an amazing piece of craftsmanship. 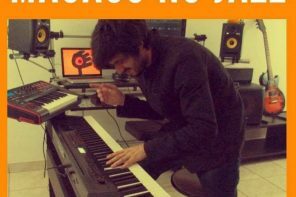 Other than VJing what other types of art do you practice? 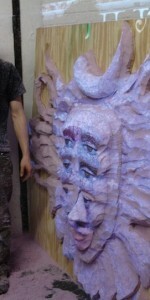 The first time I experienced your work was when Shpongle performed at The Paradise in 2009. There was no stage set up, but nevertheless the live visual presentation projected on the back wall was a mind-blowing experience I will never forget. 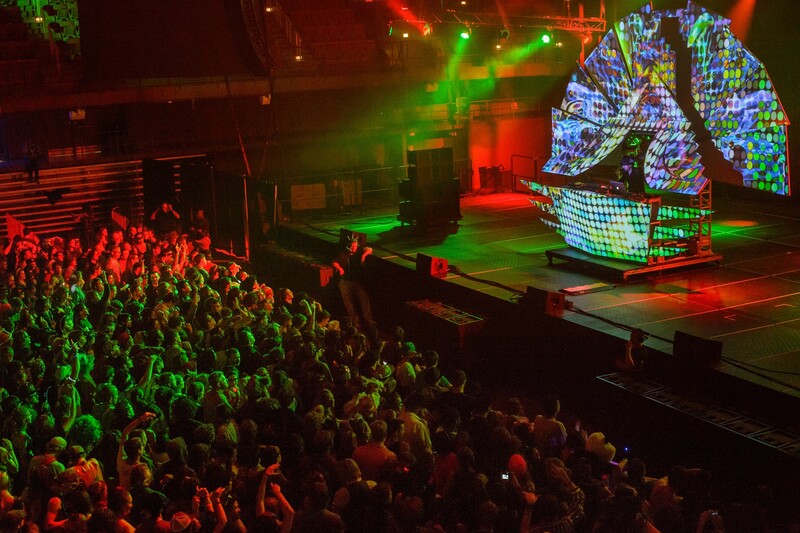 Can you tell us a little about what goes into creating a live VJ show? How do you match the visuals to the music so perfectly? Not just in terms of the timing of transitions – you also seem to match the visuals to the music thematically. 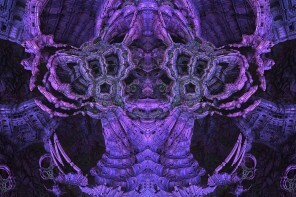 I tend to create original sets of visuals for each artist that I closely work with. We make sure ahead of time that the style of each clip matches what their music is trying to say or represent. 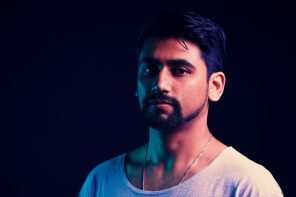 The flow comes after touring with someone for a while – you learn where they transition as well as the musical structure, and you sort out how to follow it best with visual/light representation. To be a good VJ, you basically have to imagine that you are in the band with the musician you are performing with. You are playing an instrument that emits light instead of sound but otherwise is very much part of the same performance tapestry. 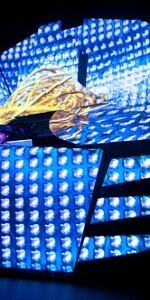 The technology involved in stage designs and visual displays is constantly evolving. As a VJ how do you keep up and stay on the cutting edge? I just throw myself insane challenges. I say – if it’s possible – lets do it. And learn a ton in the process. Even if it hasn’t been done before, but it’s theoretically possible, lets do it. I take a lot of risks and have a lot of sleepless nights, but in the end somehow figure it all out and hit the road with yet another stage design. Do you have any new revelations on the importance of haircuts from the 70s’? No, just some questions. For example, do you know if the mohawk hairstyle was from the 70’s? Or was it purely solidified as a style in the 80’s punk rock era? 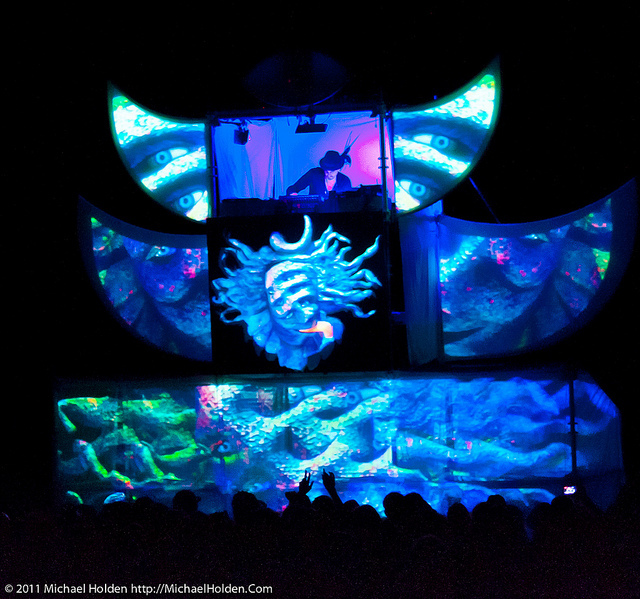 Elaborate on the different approaches you took when working on the different stage designs for Shpongle (Shpongletron 1.0 and 3.0) and the different challenges you faced with each. If any, what input did Simon have? 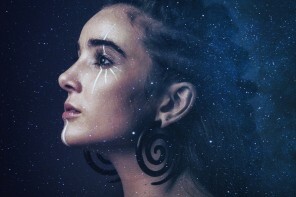 On the first one, the challenge was thrown at my by the management – it was literally “can you do this?” I received some initial creative preferences from Simon and his management, but otherwise just went with my gut. We got it done and started touring right before Amon Tobin‘s Isam appeared on the scene. 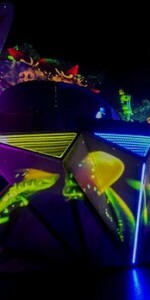 Shpongletron 3.0 design also allocated quite a lot of freedom to me in the design. 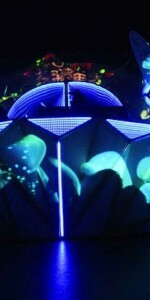 Combining LEDs and video mapping was something I had been dreaming of doing for a long time, so I took this opportunity as an excuse for this experimentation and presented a design that incorporated both, while reflecting on Shpongle’s theme and embracing both organic and synthetic qualities of their psychedelic music in my stage design. At the end of the Asheville set, Simon stepped off stage to watch the Shpongletron really go off for the first time. What do you think he was looking for in that moment? How did that moment feel for you? The venue Orange Peel is very dear to me. They took care of us as a family would. It felt great to start our tour there. We figured everything out and had a rather rocking first show. Simon walked away glowing, and so did I and all of the crew and the audience. We all felt that we have witnessed something special that night. These are the moments that make everything worth it. This caterpillar has hatched.